One of the great parts about blogging is learning about products that may be new to you. Prior to last year, I was not very familiar with Aurora Gifts and their line of kids toys and stuffed friends. Over the summer, we participated in a study about some of their new YooHoo & Friends and the website that goes along with them for children. It was a fun experience and the boys enjoyed playing with their new YooHoo & Friends critters. Of course, now when I am out and about I often see YooHoo & Friends in stores, along with other Aurora products. Recently, I was contacted by a PR representative from Aurora to see if I was interested in reviewing some of their new items that are available this holdiday season. Each of them are sold for under $20 each. Since my kids enjoyed the previous experience with Aurora items, I said we would love to. 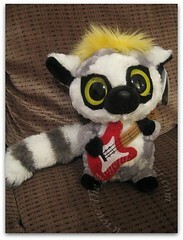 8" Large Lemmee Punk Rocker from the "Retro" YooHoo & Friends line. Aurora’s international toy phenomenon YooHoo & Friends™ aims to please kids and collectors with the release of uber-hip YooHoo & Friends dressed in 60s, 70s and 80s retro styles. The collection is fashioned after some of the most famous pop culture icons of those decades (think Elvis, Madonna, Travolta from Saturday Night Fever etc.). The medium sized, five inch “retro” YooHoo & Friends are available in seven styles including 70s Love, Punk Rocker, Pop Singer, Vegas, Flash Dancer, British Rocker and Disco Dancer. The larger, eight inch versions include Punk Rocker, 70s Love, Flash Dancer and Pop Singer. Both sizes make sounds when squeezed (MSRP: medium-$8.99, large-$14.99). YooHoo & Friends™ created the corresponding interactive website www.yoohoofriends.com, so kids and their parents can learn more about the animals (many endangered) and their natural habitats. Membership is free. On the site, visitors can play scores of games, download desktop backgrounds and coloring sheets, send e-cards, raise their own YooHoo & Friends character and much more. YooHoo & Friends is on Facebook (http://facebook.com/yoohoofanpage) and Twitter: @yoohoofriends. 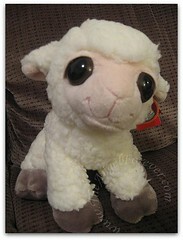 10" Lea Lamb from the Dreamy Eyes collection. 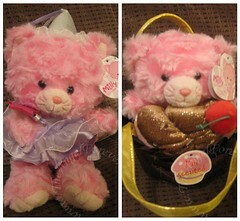 8" Milly Wanna Be Princess and 8" Pink Kitty with Chocolate Carrier from the Milly Collection. Milly WannaBes (8", MSRP: $10.99) are dressed as princess, ballerina or fairy. For girls three to seven who love playing pretend and dress up and aspire to be princesses, ballerinas and fairies. 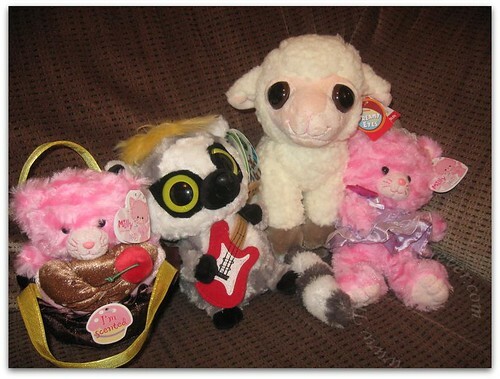 Aurora’s plush toy pet carriers have been one of the company’s best sellers for over five years. Now Aurora has introduced a line of chocolate, vanilla and strawberry scented carriers with Milly. Milly Cupcake Carriers (MSRP: $13.99) include a removable eight-inch Milly plush animal (Mini-Flopsie) and for the first time, Aurora’s plush carriers are marked with scents lasting approximately six months (the carriers range in size from six to eight inches). Aurora also has Paws Puppets, Aurora – Fancy Pals – The Original Toy Pet Carriers, and Cheeky Charlie & Carmen available on their websiteand retail stores this holiday season and beyond. When the box arrived the other day, TechyDad told me that it said Aurora outside. I knew it was for the kids, but had no idea what would be inside – it was a surprise. The kids quickly surrounded us as we opened the boys. NHL and JSL immediately started to plot which was for each of them and stated that the pink ones were for Cousin SG. What I did not expect was them to argue over the the Retro YooHoo & Friends guy. I kid you not, to this day they both insist that it is theirs and demand me to agree. Why you ask? Well, they both love the guitar on it and laugh at the whistle call that it makes when you squeeze the tummy. For now, custody of Lemee is mine and I allow the boys visitation rights so they can rock out with him. The kids thought that the Dreamy Eyes was adorable and wanted to see how soft it was. We were all pleasantly surprised with just how soft it and could see this becoming a child’s favorite to cuddle with. Because of the big eyes, it is not for children under 2. It would be a great addition to stuffed friends for the toddler/preschool set. Both of the pink Milly plushes are absolutely adorable. I am sure my niece is going to adore them when we give them to her at Thanksgiving for an early Chanukah present. SG loves kittens, princesses, and cupcakes – so there is no doubt that my three year old niece will be in love. I know that if I was teaching, the cupcake Milly would be going with me to a desk to make a cute decoration. Stay tuned, something fun for my readers will be coming soon thanks to Aurora. Disclosure: This review was made possible by Aurora Gifts and their PR company. They provided me with the items shown above to facilitate this review. The opinions of this review are mine and I received no other compensation. These guys are ridiculously cute! Yoohoo, my Chocolate Lab, wouldn’t be able to resist them either.